The global solar charge controller market is poised to exhibit impressive growth in the coming years. This is also indicative of the high competition the market is likely to witness in the near future. As per a new study by Transparency Market Research (TMR), the most prominent market players are likely to shift focus from developed markets to emerging nations. Through this strategy the market players will expand their regional footprint, thus strengthening their position in the global sphere. As per TMR, OutBack Power Inc, Xantrex Technologies, Genasun LLC, Luminous Power Technologies Pvt. Ltd, Wenzhou Xihe Electric Co., Ltd, Phocos, Beijing Epsolar Technology Co., Ltd, Steca Elektronik GmbH, and Sollatek are some of the leading players in the global solar charge controllers market. TMR pegged the global solar charge controller market at US$22,653.4 mn in 2016. Rising at a promising CAGR of 16.2% between 2017 and 2025, the market is likely to reach US$86,087.5 mn by the end of 2025. While the demand for solar charge controllers is rising across diverse end-use sectors, it is the utility scale segment that accounted for the leading market share in 2016. During the forecast period, growth witnessed in the solar home systems and industrial building segment is also likely to rise. Regionally, Asia Pacific held the dominant share in the market in 2016. 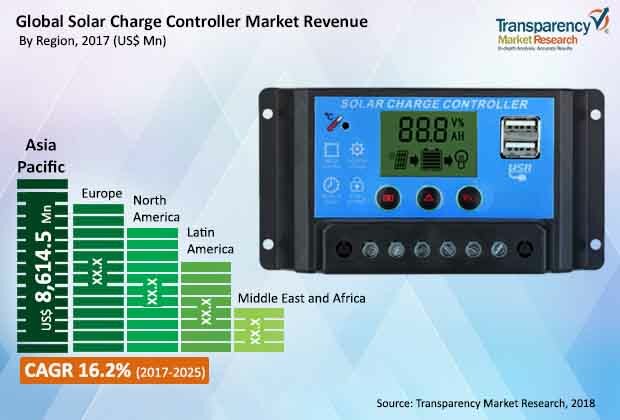 Rising industrialization, increasing demand for energy, and favorable initiatives by government will support growth of the solar charge controller market in Asia Pacific. In addition, Latin America and the Middle East and Africa are likely to report impressive growth in the coming years. The coming years hold impressive growth prospects for the global solar charge controller market, as per TMR. The market will considerably benefit from the increasing use of solar energy and steps taken to curb the dependence on non-renewable energy sources. Also favorable climate change policies and clean fuel agenda will chalk a positive growth trajectory for the global solar controller market. Besides these, rising investment in renewable storage solutions and implementation of stringent policies to curb pollution will create lucrative prospects for the market’s growth. In the coming years, market players will also benefit from the rising awareness among consumers. On the downside, the cost of deriving energy from solar power is more than that of conventional sources. This could act as a major restraint to the market’s growth. Furthermore, the maintenance cost incurred on solar charge controllers is comparatively higher than their traditional counterparts, which could hinder the market’s trajectory to an extent. Nonetheless, growth trajectory will remain positive on account of the rising investment in renewable storage solutions. Also active participation from different quarters of the society will create an environment conducive to the growth of the global solar charge controller market in the coming years. Additionally, the market will benefit from increase in the development of off-grid electrical systems and accelerating solar energy installations. In the coming years, an increasing number of developing nations are likely to maximize their use of solar energy to curb the dependency on fuel-based power generation. This will be achieved by the implementation of stringent regulatory frameworks. Also steps taken by governments and international bodies to spread awareness regarding renewable energy sources will have a positive impact on the global solar charge controller market.